I have a confession to make. I love shopping at Costco. My heart starts to pound when I see 1.5kgs of butter and my palms get itchy walking by the 1kg peanut butter jars and 2kg cream cheese blocks. I could often be seen at the front of the line when a new batch of sample steaks are about ready and I would rarely say no when staff offer me free cheese to try. When my mum and I joined Costco, we literally spent $400-500 each time we shopped there. In fact, I think she still does. My rational is that sometimes it’s just convenient to buy things in bulk when you know you need it for say a large party, or because well, they just look so cool (how awesome would it be if you built a house with butter bricks? It might melt in the sun but still…) and Costco is so far away from me so I have to get more of what I need in one go….ok…deep breathe. Of course, one of the issues that come with buying in bulk is buying too much of something that you possibly won’t need or use for a very long time (talking from experience here) and it’s bad when the product is perishable (duh), tiny bit better if it can be frozen (if you have the freezer space). Just the other day, I was digging through Yuye’s freezer and found a bag of mixed frozen berries that I haven’t seen for a long time. I panicked. It had 500g of berries left and was nearing its expiry date. A lot of recipes went through my head at that moment, in a frantic struggle to not let a perfectly good bag of berries go to waste. 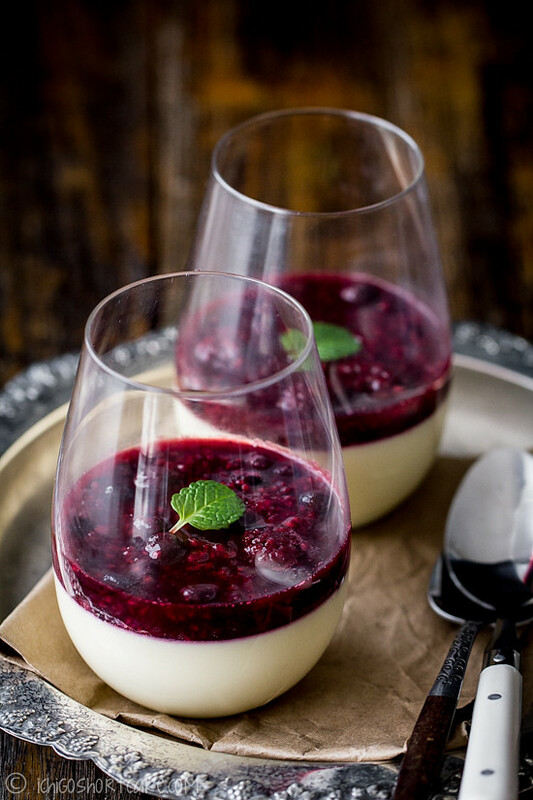 The recipe that I settled on was this lovely vanilla panna cotta with mixed berry compote. The compote turned out a little more watery than I wanted but that’s because the berries were not as fresh. You can tell if the berries had huge clumps of ice stuck to them, signalling that you will get a lot of water in your compote. If you used fresh berries or a fresh bag of frozen berries, it should turn out a lot better. I made a mental note that next time I buy a bag of these frozen berries, I need to have a few recipes lined up first. Also feel free to substitute mixed berries with just one type such as blueberries as this will also turn out very well. 1. Combine cream and 50g sugar in a medium saucepan on medium heat. Add in vanilla bean seeds and pod (or vanilla extract) and bring to a simmer, stirring to dissolve the sugar. Discard vanilla bean pod. 2. Pour the 2 tbsp cold water in a small bowl, add in gelatine powder and let sit for roughy 10 minutes – do not stir. 3. 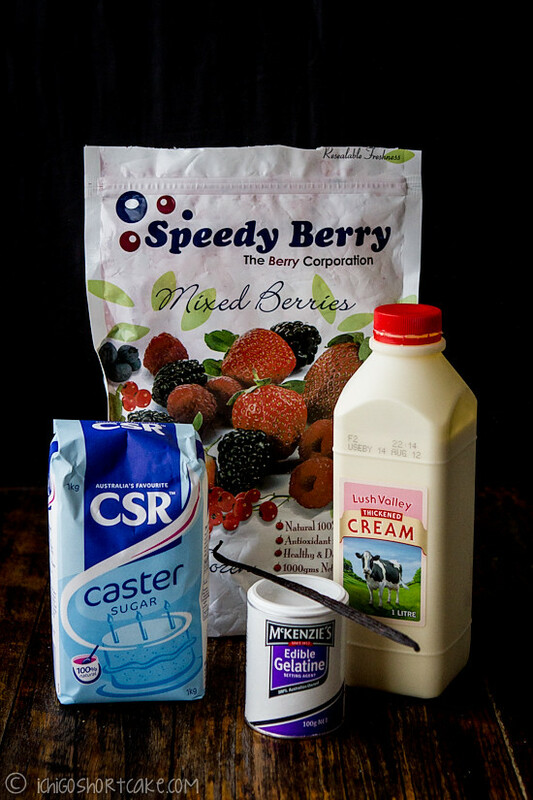 Pour simmered cream mixture over gelatine and stir until all the gelatine is dissolved. 4. Pour cream mixture into 4 serving glasses or ramekins and leave in the fridge to set for a few hours or overnight. 5. Put frozen mixed berries, sugar and vanilla in a medium saucepan and heat on medium high until melted and soft. Stirring occasionally to melt the sugar. 6. Take off heat and cool. 7. 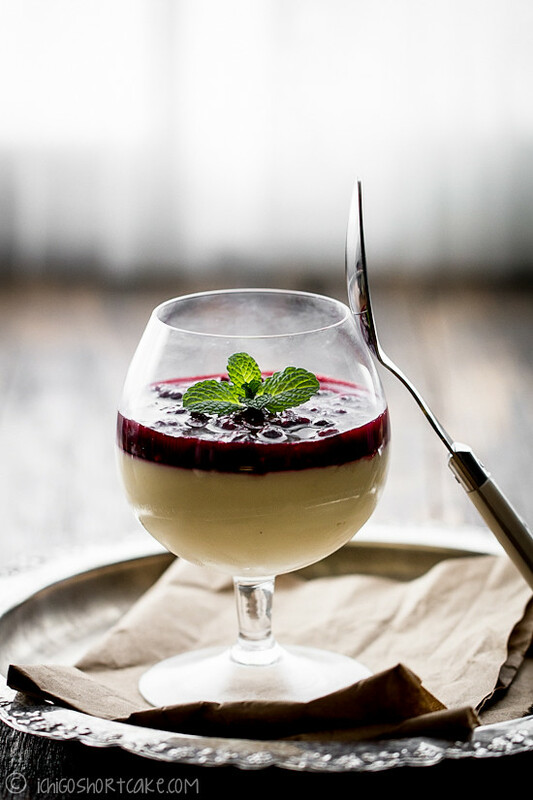 When the panna cotta has set, in the fridge and ready to be served, spoon berry compote over the serving glasses and top with a mint leaf. Serve chilled. 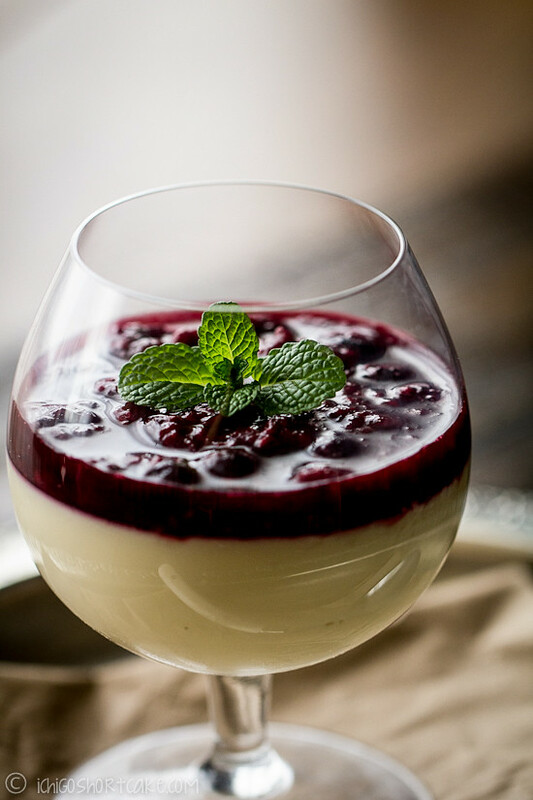 Panna cottas are so easy to make and can be made ahead of time so they are perfect party finishers that can wow guests. Question time: Do you like to buy ingredients in bulk or do you like to shop more often and buy in smaller portions? Thanks Rosa! 🙂 We ate all of the between the 2 of us, I admit I was a little sick of cream after that but it was still quite delicious. The berry compote really helped to cut the heaviness which was good. I love, love, love the look of that mixed berry compote. Yum! It was yummy indeed. 🙂 Would have been better with fresh berries though. When summer comes around, I will make this again with fresh ones! I know what you mean! One of my friends loves preparing individual servings and she has boxes of cute little cups and things. I need to find some more but you’re right about no space in the house! Thanks for dropping by…what a spectacular panna cotta this looks! Beautiful clicks. Panna-cotta has to be one of my favorite desserts ever especially in the summer. I find it it so light and refreshing. Your’s looks amazing with the wonderful blueberry sauce. Lovely presentation! Oh it’s one of my favourites too! It’s definitely a good change from the heavy cakes, not to mention very easy to make! I love all the cool stuff you can get at Costco. But the sizes are just too much (there are only two of us). So we no longer go, alas. Anyway, nice looking panna cotta. The mixed berry compote looks superb. And the presentation is very attractive. Jenny, we can hang out in Costco! We go every week and drop $ there (and get hotel points from credit card which is not bad – haha). Well, I’m terrified by the amount of butter though (lol), and I also don’t like super-big package, instead of multiple smaller portion package… Anyway, I came here to say how beautiful your panna cotta is. Love love looooove your presentation. I can easily eat two servings if pnna cotta is this delicious! Costco is my sanctuary too! And this panna cotta is incredibly stunning! What a gorgeous presentation! I adore panna cotta – this is certainly a recipe I’d love to try. Also… I’m with you on Costco for entertaining. The place drives me mad if I don’t have a mission (ie: feeding 10 people this weekend) but for cocktail parties, dinners, etc, it can’t be beat! I would pay money for this! So pretty! Oh this dessert looks so beautiful and fresh perfect for the hot Summer months! Gorgeous photos! My husband loves penna cotta. I must make this prompt! By the way, you’re very funny! I’m proud member of Costco too! Has anyone tried doubling this recipe or is it better just to make it twice – not sure how gelatin performs if doubled. Doubling the recipe shouldn’t be a problem, as long as you dissolve the gelatin properly and mix it well. If you keep the whole thing in one container though it might take a tiny bit longer to set in the fridge since it won’t cool as quickly. Hope you like the recipe! You mention that the recipe can be made ahead of time. Can it be made a day ahead or only hours? It’s going to be a lovely addition to my Easter dinner.